Take a deep breath. In fact be greedy and take two!! Did you know we breathe about 23,000 times a day?!?! Really, 23,000 times a day! I swear it – I did the math! And most of those 23,000 times we are not even paying attention to the fact that we are breathing. Hmph. So… imagine if you stopped for just two of those breaths (yes, I am upping the ante from one deep breath a day to two!) and really thought about what you were doing. Breathe in deep and long and slow and really expand those gorgeous pink lungs you have in your chest cavity – fill up that space from collarbone to belly button. Flatten out your diaphragm. Pause for a moment. Then let it out. THEN, do it again! Aaah. Try it. You might like it! 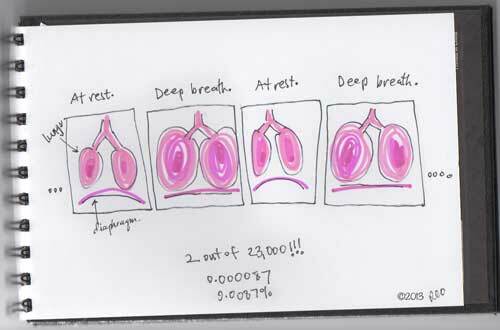 This is my gift to you – a kind reminder to breathe deeply and slow down 0.0087% of your breathing day! (That is 87-thousandths of a percent of your breaths per day – I am sure you can find time for that, right?!?!) Happy Holidays! P.P.P.S. Truly – HAPPY HOLIDAYS!